1. Diamox – Brad and I both took diamox, Nick didn’t. Nick was fine, but I would never do anything like this without diamox. It makes you have to pee more and it makes your hands and feet really tingly, but overall it forces you to breath more and pull in more oxygen (that’s why you get tingly). I had limited altitude issues and thought it must just be because of the pole pole walking. Not the case. 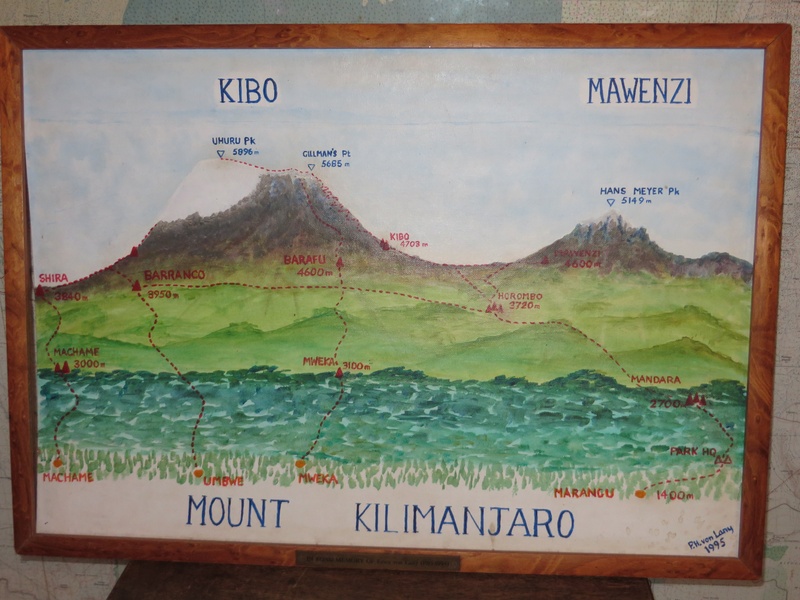 I stopped taking diamox after we summited and the worst altitude issues I suffered were later that night at Horombo huts, some 7000 feet below the summit. I could barely walk to dinner without being winded. If I had continued to take it, I think I would have been ok. If I could go back in time, I’d take it until the last day. 2. 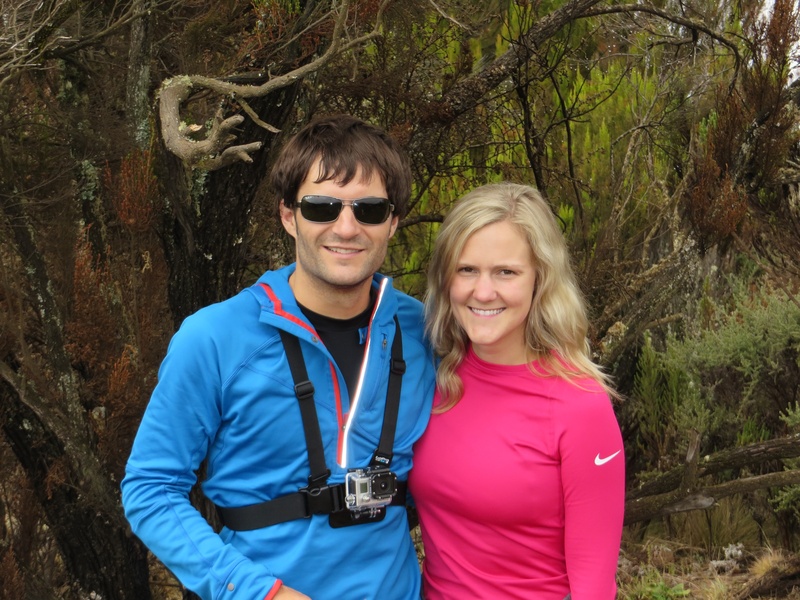 Marangu route – we chose the Marangu route. You can get up the mountain quicker, and it’s regulated well by the park. This is also the only route with huts and we liked that. Marangu gets kind of a bad rap sometimes. It’s called the easy route (coca-cola versus whiskey route, which is Machame) but I don’t know of anyone that thinks climbing this monster is easy. Desmond said that because there are huts and Marangu is so popular, it’s actually cleaner and less crowded since it’s more cared for. On Machame, where you tent camp, it’s not regulated and has been really overcrowded recently. Our guides also said that tent camping up there is really uncomfortable and cold. Weather changes in an instant; we’d rather be in a hut. 3. Length of your climb – because of the diamox, we were ok with 5 days, but apparently that’s rare. People were really impressed that we did it (from other climbers to locals) but all the credit goes to our guides who got us up there. I got psyched out because we were the only 5 day people we met. If you are impacted by altitude and are nervous about 5, go with 6. It would have set my mind at ease more, for sure. 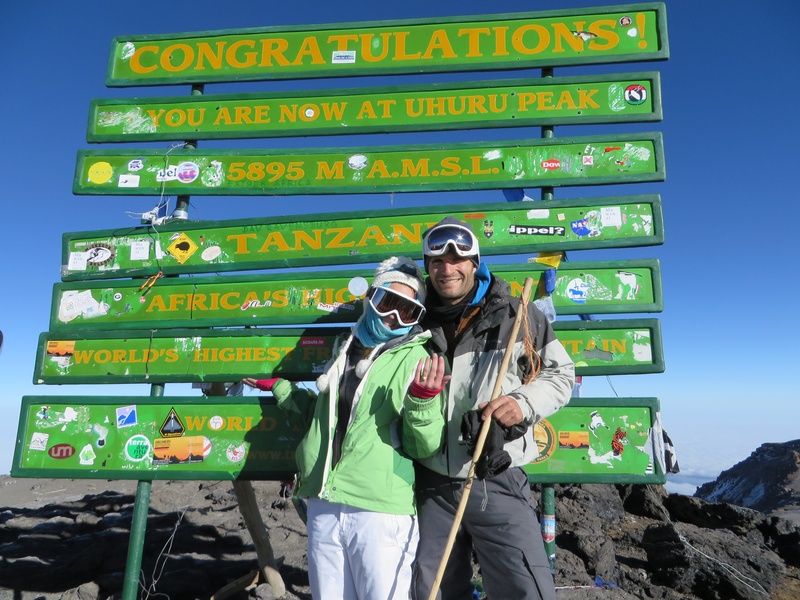 And Kili is as much, if not more, a mental than a physical challenge. Now, I wouldn’t go back and change this decision. 5 was great and gave us more time in Africa. 4. Don’t overeat before the summit. Your body won’t digest things well and you won’t get the energy you need. Little cookies and candies are great. Cliff bars are not. 5. Running water does not equal showers! Bring shower wipes with you. We used shower pill brand and they were great. 6. Porters – look in to how your company treats porters. I saw a few that had WAY too much stuff. It was very upsetting. Our company was great and I would go with them again in a second (Marangu Hotel). 7. Drink lots of water! Its the best way to combat altitude issues. 8. Sleeping bag liners – Brad’s great friends Greg and Chelsea told us about sleeping bag liners before our trip, and we decided to try them out. LIFESAVER!!! We got the “extreme” kind from REI and stayed very warm all night. I even wore mine around at Kibo when I was freezing. The sleeping bag by itself was not enough, even if it’s made for cold. Plus, the liner can be used on its own in the summer, so we will get use out of it! Best thing we purchased. 9. Guides climb Kili in button down shirts and nice church-style pants. It was shocking to us! If you have some equipment you can leave behind (like our headlamp, or a backpack or anything) consider bringing that and sharing with your guides at the end. It’s appreciated and many of those things are just not available in Tanzania. Also made us feel like lame-os that had to have our high-tech shirts and under armour! 10. Batteries – batteries hate cold. Desmond told us to sleep with our batteries in our sleeping bags (not our full cameras though because of condensation). Great tip. We each had 2 camera batteries and used them both up because of the cold. It would have been worse if we hadn’t have slept with them, too. 11. Camelbaks – our camelbaks were great, but they freeze near the top. Bring a water bottle too. And bring more water than you think on the last day. Brad and I ran out near the top and had to rely on Nick for some much needed water! Especially given the dusty run back down the mountain when you crave water even more. 12. Sleep with your socks and gloves in your sleeping bags. Then you don’t have to put on cold things in the morning. 13. A quick dry towel is great. Mine was a lifesaver and is super small. 14. Your day pack doesn’t need to be huge – I had a very small backpack (like, tiny). No mountain backpacks needed. Only bring things you really need – backpacks get heavy quickly. I took like half of my stuff out of mine the second day. 15. Our Marangu hotel walking sticks were awesome. You only need one walking stick, and it just needs to be a basic stick with a sharpened tip. 16. Bring a few garbage bags to protect your stuff in case of rain or snow. Also, your stuff will be filthy. Muddy, dusty, and just dirty. This is a good way to protect your clean things! Additionally, if you are going elsewhere in Africa after the climb, this is a necessary way to quarantine your disgusting, horrible smelling clothes. Our big ziploc bags and compression bags were key for keeping clean things clean! 17. Save a pair of clean, dry socks for your last day. Climbing down the mountain results in bad blisters. 18. Before leaving for the summit, take an advil and pepto bismol proactively. 19. Bring a little notebook with you. You can write down fun memories or brainstorm random things. 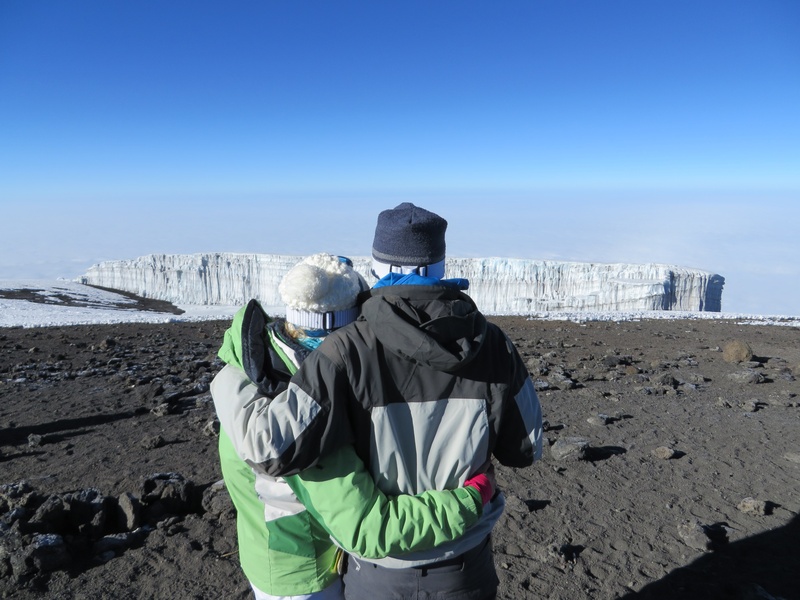 Climbing Kili teaches you a lot and you think a lot on the way. What you are worried about when you go up is very different from when you come back down. This puts a lot in perspective. Cards and bocce ball were crucial too. Love the updates. Sounds so awesome. Wonderful lessons to learn and share!